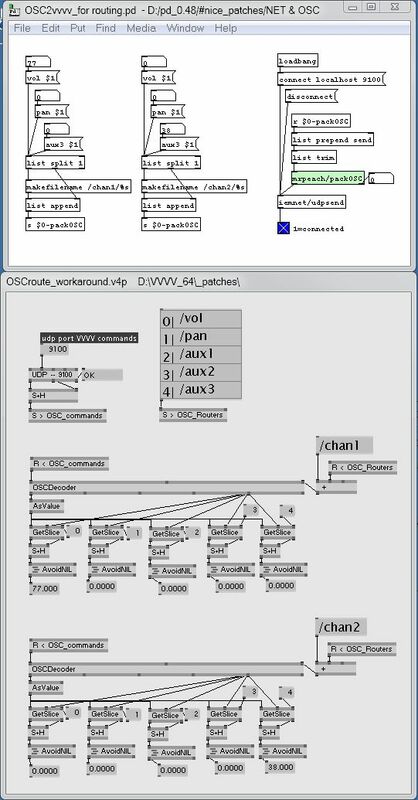 I have a UDP/OSC connection from PD to VVVV and would like to receive many messages in VVVV and distribute the messages in a way similar to [routeOSC], which parses the messages according to each “/”-separated pattern. First i want to distribute all messages matching pattern 1 ("/chan1"), THEN (in a second step) distribute them according to pattern 2 ("/vol", “/pan”, “/aux” etc.). I know how to parse OSC messages by their total address, but i can’t figure out how to route the result like described above. the reason it is not possible in vvvv is because i never understood the usecase and also nobody has asked about this before. so could you please elaborate whats the benefit of routing sub-addresses instead of parsing for a full address? The reason why i wanted sub-address-routing is probably only because i’m so used to it in the PD world. I think i still have to adapt to the VVVV way of thinking. Plus i was unaware of the many string-manipulation possibilities that VVVV offers (something that is much more tedious in PD). However, a few rounds around town with the bike brought the solution to my mind, or at least a totally valid workaround. The reason why i wanted sub-address-routing is probably only because i’m so used to it in the PD world. Thanks a lot for simplification !